Good things come in small packages, as is evident by exploring the new Toyota Prius. As a leader in the compact hybrid market, this iconic vehicle continues to impress with its abundant safety features. 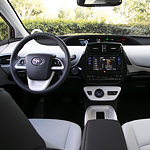 The vehicle safety experts at Toyota Of Plano are eager to share our enthusiasm with you about the Toyota Prius and all of its innovative features, designed to give you 100 percent confidence in any driving situation. The Automatic High Beams are engineered to help drivers see more clearly in dark driving conditions. The intuitive system kicks in at speeds over 25 mph and helps to differentiate between the lights of oncoming vehicles, delivering the appropriate amount of light automatically. The integrated backup camera is designed to give drivers peace of mind when reversing. The camera works to help drivers to navigate out of even the trickiest of parking situations or the tightest spots with ease.